I was supposed to take the ball out. I told coach, 'There's no way I'm taking the ball out unless I can shoot it over the backboard and go in.' So I told him to have somebody else take the ball out, give me the ball and everybody get out the way. In clutch situations, teams tend to run their offense through their stars (or in Lebron's case, the star runs the offense). At its best, you get iconic moments like Michael Jordan's game winner in the '98 Finals and Lebron's aforementioned heroics. At its worst, you get low efficiency desperation, clock draining iso play, and heavily contested, off the mark mid-range jumpers (sarcastically referred to as "hero ball"). Earlier this season, I launched clutch shooting reports. 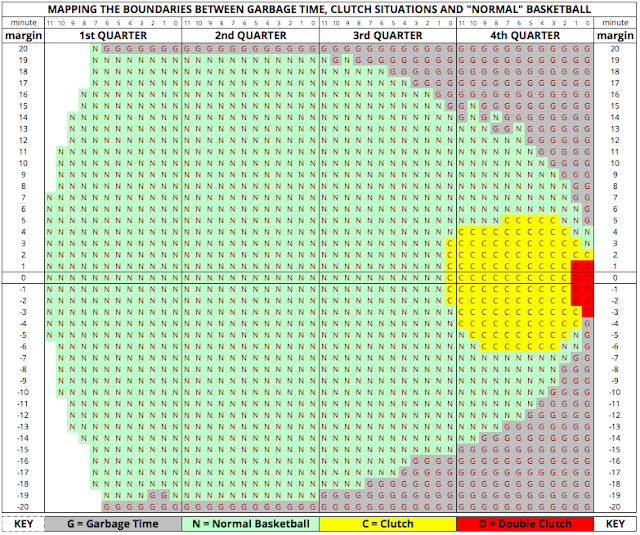 This interactive report uses win probability to classify shots into four basic categories: garbage time, "normal" basketball, clutch, and "double" clutch. That fourth category, double clutch, represent the top 1% of shots in terms of potential impact on a team's chances of victory. The following chart summarizes these four phases as a function of score difference and time remaining. For double clutch situations (that splotch of red on the right), shot attempts are more concentrated among a handful of a team's key starters. At the other end, garbage time, shot distribution is much more spread out. Teams put their bench players on the court, and, in general, starters and bench warmers alike are more prone to chuck it when the stakes are low. Is there a way to quantify this shift in shot distribution? If so, we can also quantify which teams are most prone to "hero ball" - the tendency to run the offense through a single player (or players) when the stakes are the highest. There are a multitude of ways to quantify how equally, or unequally, a resource is shared among a group of people. The most common of these is the Gini coefficient, and its most frequent use is to measure income inequality among nations. A Gini coefficient scales from 0 to 1, with a greater coefficient implying greater inequality. A nation in which each citizen had the exact same income would have a Gini coefficient of 0. A nation in which a single individual hoarded all the wealth would have a Gini coefficient of 1. For all shots, NBA teams spread the wealth about as well as Denmark, with a Gini coefficient of 0.292. Garbage time is the most egalitarian, with a Norwegian coefficient of 0.263. But for the biggest shots, things go from Nordic to tinpot. Double clutch shots have a Gini coefficient of 0.524, comparable to that of Guatemala's. A technical note: the Gini coefficient used here is the weighted version, where the weight used is minutes played (this prevents a player with just 15 minutes played over a season from skewing the overall Gini coefficient). Here is a breakdown, by team, of the Gini coefficient for double clutch attempts. Cleveland sits atop the hero ball index. 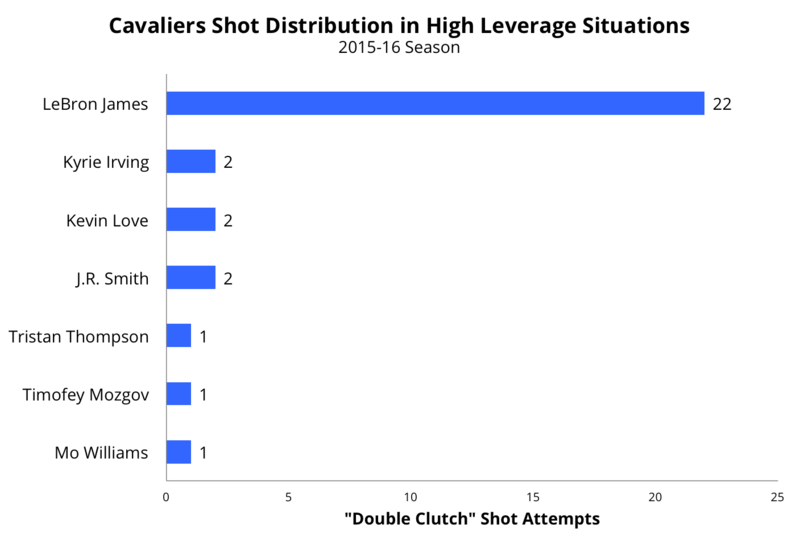 72% of "double clutch" shot attempts have been taken by a single player, Lebron James. The next two teams on the list, Miami and Oklahoma City, are similar in that two stars dominate in crunch time. For Miami, it is Chris Bosh and Dwyane Wade, with 34% and 49% of double clutch attempts, respectively. As one would expect, for the Thunder, it's Russell Westbrook and Kevin Durant, with 39% and 48% of attempts. The Memphis Grizzlies are the "not it" team this year. No player on the Grizzlies accounts for more than 20% of double clutch shot attempts. "Everybody get out the way" indeed. The table below has Gini coefficients by team for the past seven seasons. The 2011-12 Oklahoma City Thunder have the highest "Hero Ball Index" over that time period. Kevin Durant and Russell Westbrook accounted for 95% of the team's double clutch shot attempts, leading to a Gini coefficient of 0.749. 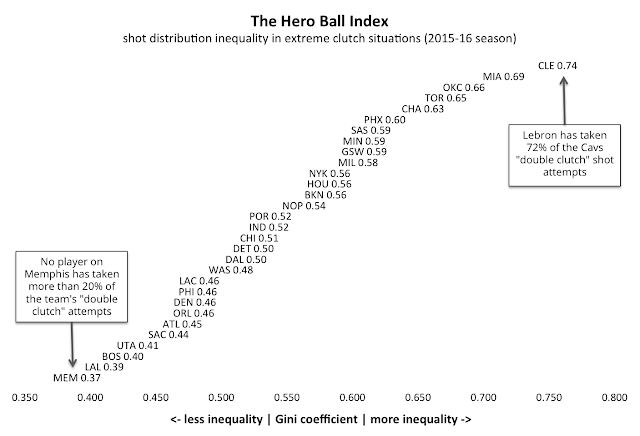 In fact, five of the top eight spots on the hero ball index belong to the Thunder.